In the morning, I wake up to the sound of waves crashing on the beach. 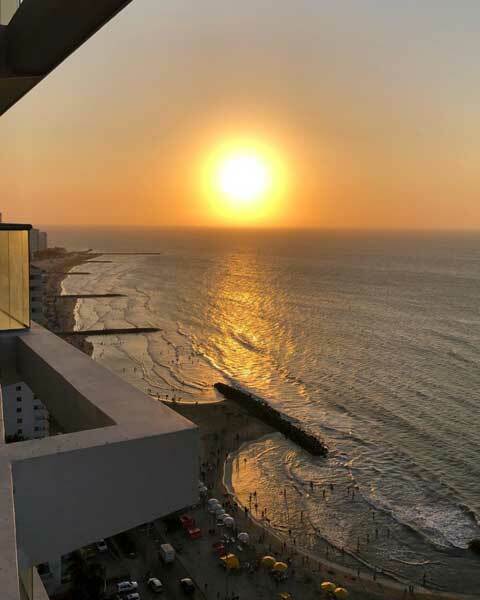 At sunset, I get to enjoy million-dollar views like this one from my beachside condo in Cartagena, Colombia. I shared this picture with some of my relatives yesterday. And I got a question that I often get when I share photos from my travels. I get why people ask. In Miami, a room with a view like this would easily cost around $300 a night. But I’m only paying about $100 a night. These are the deals you can only snag in the developing world. Are we about to witness the biggest new trend of our lifetime? A former money manager, famous for predicting the renter trend, legal marijuana wave, blockchain boom, and Bitcoin bubble is going on record with his next prediction—as a new industry goes from essentially $0… to potentially $400 billion over the next few years. If you’re searching for new opportunities to potentially turn a small investment into a nice nest egg, be sure to give this report a read. That’s because Colombia has a reputation for being dangerous, and for good reason. In the ‘80s and ’90s, it was one of the most dangerous countries in the world. Rival drug cartels didn’t think twice about killing each other in broad daylight. And it’s true that there’s still an element of danger, but that’s true of anyplace in the world these days. Nonetheless, most Americans would rather soak up some sun in Miami or Hawaii. If they do go abroad, Cancun or Cabo San Lucas is about as exotic as most people get. It’s also true of investing. Most American investors only own U.S. stocks. This is because they know what they’re buying when they buy U.S. stocks. They’ve eaten at McDonald’s. They’ve shopped at Walmart and on Amazon. They bank with JPMorgan Chase or Bank of America. U.S. stocks have also been easy money lately. The S&P 500 is up 288% since early 2009. With returns like that, you may be wondering why you should even bother owning foreign stocks. There’s no guarantee that U.S. stocks will go up again this year. In fact, as I’ve shown you in recent essays, major red flags are popping up, specifically in the credit market. That’s why I’ve been encouraging readers to lighten up on risky U.S. stocks. But that doesn’t mean it’s time to panic and sell everything. Instead, you need to be very careful about the stocks you own. And be willing to look outside the U.S. market. You see, there’s a group of stocks poised to deliver big gains this year. Emerging markets are countries that are on their way to being developed countries like the United States and Germany. China and India are the two biggest emerging markets. Unfortunately, I haven’t made my way to those countries yet. But I have spent a lot of time in other emerging markets. In the past year alone, I’ve been to Colombia, Mexico, Peru, Turkey, Portugal, Poland, and Hungary. I also spent five weeks in Argentina, which was recently demoted from emerging market status to “frontier” status. I went to these places because it’s my job to find the world’s top money-making opportunities and share them with you. And I can’t do that sitting at a desk from 9 a.m.-5 p.m. all week. Each country I’ve visited is unique. But these emerging markets also had a lot in common. For one, none of these places was as backwards as the average American probably thinks. And most of them are growing rapidly. 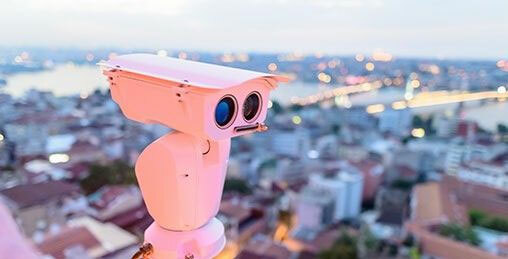 A controversial new technology is expected to hit every neighborhood in America—even YOURS. It’s already being reported on in The New York Times, The Wall Street Journal, and The Washington Post. Find out what it could mean for you and your wealth. You can see what I mean below. 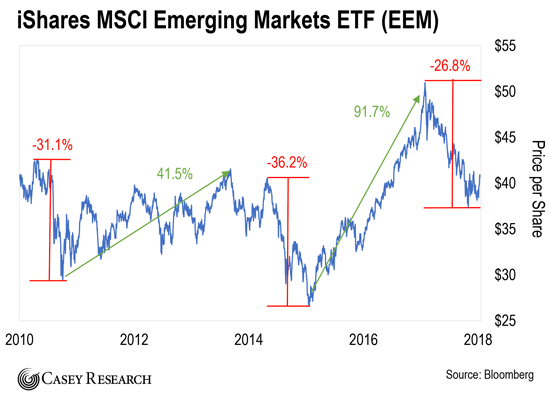 This chart shows the performance of the iShares MSCI Emerging Markets ETF (EEM), which tracks over 800 emerging market stocks. 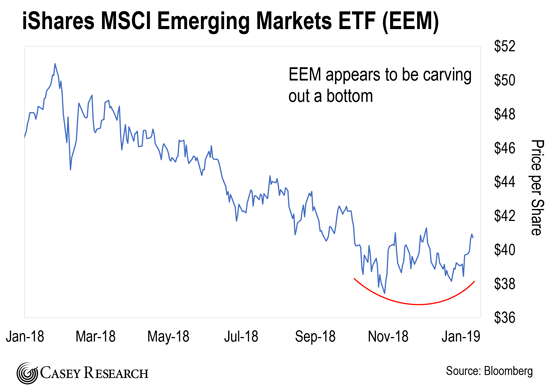 You can see that EEM fell 15% in 2018. That was its biggest decline since 2015. An asset carves out a bottom when it stops falling, trades in a tight range for a period of time, and then starts moving higher. This signals that buyers have stepped in and given the asset’s price a “floor.” It’s a major clue that the asset is ready to climb higher. In other words, emerging market stocks could soon turn the corner and start rising again. I say this because we’ve been here before. You can see what I mean below. This chart shows the last two major corrections by EEM. The first one came after a 31% correction in 2011. EEM went on to rally 42% over the next three years. The second major rally followed a 36% correction that took place between 2014 and 2016. EEM would go on to rally 92% in just over two years. 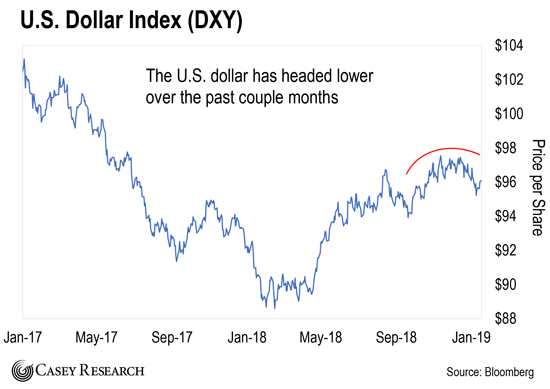 It now looks like we’re on the verge of another big rally, and there are many potential catalysts that I’m watching… but the biggest is the U.S. dollar. You can see what I mean below. This chart shows the performance of the U.S. Dollar Index since the start of 2017. This index tracks the dollar’s performance against major currencies like the Japanese yen and the euro. You can see that the U.S. dollar (USD) is starting to roll over. It’s down 1.5% since November 12. In other words, it’s doing the exact opposite of what emerging market stocks are doing. And there’s good reason for this to continue. This hasn’t happened since March and April 2017. The U.S. dollar went on to fall 10% over the next six months. As you can see, it’s a great contrarian indicator. And it signals danger ahead for the dollar. Of course, you’re probably wondering why a weak dollar is good for emerging market stocks. Simple. Specifically, they loaded up on U.S. dollar-denominated debt. According to Business Insider, about $500 billion worth of USD-denominated bonds and loans, issued by emerging market governments and companies will come due this year. By 2026, around $2.7 trillion worth of USD-denominated bonds and loans will have to either be paid off or refinanced. That debt becomes more expensive to service when the U.S. dollar is strengthening. When the dollar is weakening, it becomes easier to service. This is why a weak dollar is lifting emerging market stocks. That said, the U.S. dollar hasn’t broken down yet. So add EEM to your watchlist if you haven’t yet. Just remember that emerging market stocks are volatile. Treat them like a speculation if you decide to invest in them. Don’t bet more money than you can afford to lose. And take profits along the way. In May 2018, the Supreme Court issued a landmark ruling. And in turn, opened up the floodgates to a multibillion-dollar industry overnight. Today, all 50 U.S. states now have the power to license, regulate, and tax sports betting within their borders. And states are already stampeding to go all-in on the sports betting rush. Just weeks after the decision, Delaware became the first state to launch a full-scale sports operation under the new ruling. It took in over $7 million in sports bets in the first three weeks. New Jersey launched legal sports betting on June 14. Through the first 17 days, it took in over $16.4 million in bets. And this is just the beginning… Today, about a dozen other states are currently working to pass new laws. This is a huge opportunity. Billions are up for grabs. Consider that in 2017, sports fans bet an estimated $10 billion on the NCAA Final Four. They bet upwards of $5 billion on the Super Bowl. Add in 16 regular-season NFL games, a full MLB season, hockey, and prop bets on everything you can imagine… and the total amount wagered on sports was well in excess of $100 billion. Keep in mind, that’s a rough estimate. Until the first legal sportsbook opened in June, sports betting outside of Nevada required finding a bookie to take your bet. 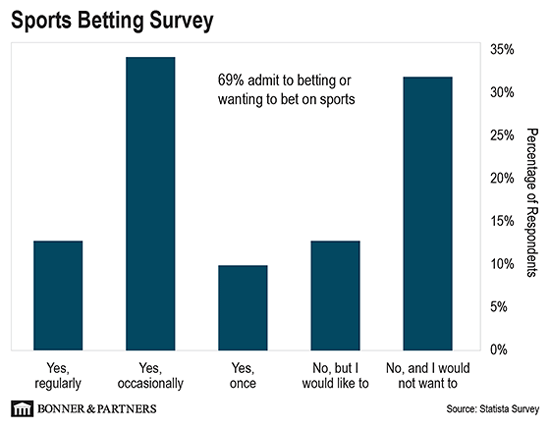 Even while it was largely illegal, 57% of sports fans surveyed admitted to placing at least one sports bet. That number climbs to 70% when you add in those who haven’t placed a bet but would like to. Whenever we see a once-illegal market step into the mainstream, the entire market has to readjust. Entirely new companies are created. Stocks soar. Early investors can make a fortune. Just consider in 2016, the illegal cannabis market in the U.S. was estimated to be worth about $46 billion. But with pro-cannabis legislation sweeping the country, the legal pot market is forecast to reach $146 billion by 2025. That’s more than a 200% increase. That’s the sort of opportunity we have today. P.S. With the ban on sports betting in the U.S. now gone, you may be tempted to go out and buy stock in the biggest Las Vegas casinos. I’d encourage you not to do that. That’s because the Vegas casinos won’t benefit from this new ruling. In fact, it could even harm them. 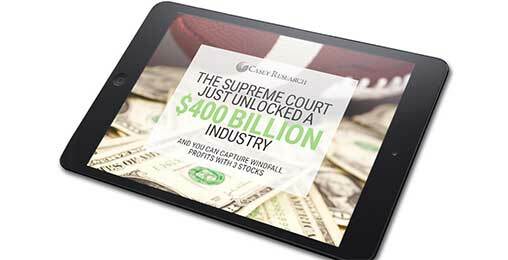 I’ve identified three publicly traded companies that are primed to soar as legal sports betting goes mainstream. And the time to get in is now. If you’re interested in learning more, I invite you to attend a landmark event tonight at 8 p.m. ET. During this exclusive summit, I’ll share more details on these three opportunities… all of them have the potential to soar 1,000% in the weeks to come. I’ll also share why this explosive new market could be 40 times bigger than the legal marijuana industry in a matter of years. You can sign up for free right here. Won’t all these new electric cars also be smart cars, able to track all our movements, just like our smart phones and smart TVs do now? And if the electronic grid shuts down, won’t they be useless? If this happens, how do we provide the necessary power to feed the battery requirements? Will this mean an increase in power plants to provide the extra capability. The other question is the infrastructure need to keep these vehicles on the road. Technically, EVs produce “zero emissions,” but the emissions are just transferred from the vehicle itself to the power plant source. Unless that source is nuclear, the pollution is just moved to another place! Obviously, “Jack” is not a reader of Casey. . . Doug has never been one to shrink from calling out incompetent politicians, nor imbecilic political ideas. Regarding Jack’s advice for Doug to avoid damaging his “brand” by sharing his opinions on politicians. . . His beat is economics. . . Which, of course, is inextricably linked to politics. If you have any questions or suggestions for the Dispatch, send them to us at [email protected].